This post continues details of our driving tour of Kohala, which we enjoyed on our fourth day on the island of Hawaii (Thursday, May 20th). Our first stop was at Manini’owali Beach. Our second stop was in Kawaihae at the Pu’Ukohola Heiau National Historic Site. Our third stop was at Lapakahi State Historical Park. Our fourth stop was at King Kamehameha’s birthplace. Our fifth stop was at the Pololu Valley Lookout. Our sixth stop was in Kapaau. It would be difficult to miss Kapaau’s main point of interest — the King Kamehameha Statue. The statue towers over Route 270. The King Kamehameha statue has an interesting history. According to a Wikipedia article, the statue had its origins in 1878 when Walter M. Gibson, a member of the Hawaiian government at the time, wanted to commemorate the 100 year discovery of Hawaii by Captain Cook. The legislature appropriated $10,000 for the project and made Gibson the director of the project. Gibson contacted Thomas R. Gould a Boston sculptor living abroad in Florence, Italy to create the statue. In 1883 the statue was placed aboard a ship and headed for Hawaii. In the proximity of Falkland Islands the ship wrecked and with it the statue. The Hawaiians, however, had insured the statue for $12,000 and Gould rushed to complete a second. Before the second statue could be sent the original was recovered by some Falkland Islanders. They sold the statue to the captain of the wrecked ship for $500. The captain, in turn, sold the statue to Gibson for $875. The statue that stands in Kapaau is the original statue. The re-ordered statue stands in front of Iolani Palace in Honolulu, Hawaii. My sister-in-law emailed a photograph to us a week ago. Dorothy and John returned to Kapaau on June 12th. Kamehameha Day is celebrated on June 11th. On that day the King Kamehameha statue is draped in lei. Dorothy took this picture of the King Kamehameha statue. 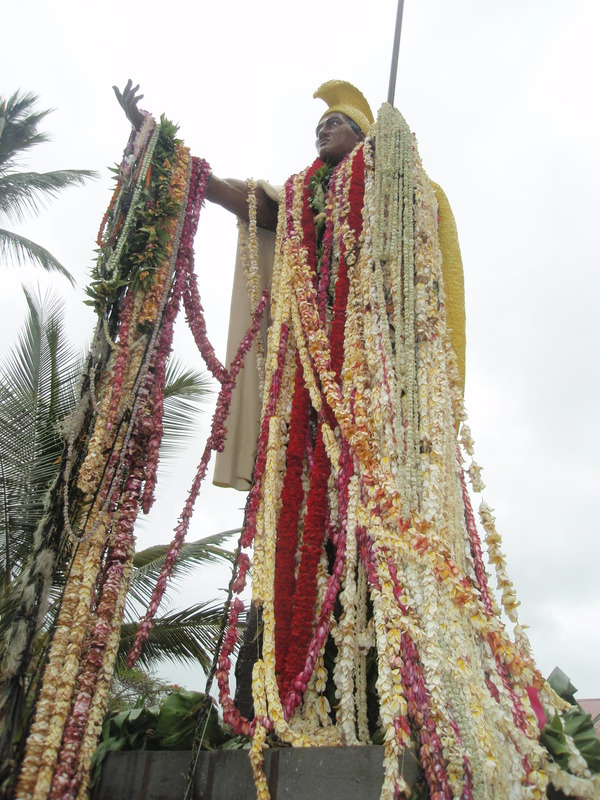 The statue is draped in lei on Kamehameha Day, which is celebrated on June 11th. After photographing the King Kamehameha statue, we walked across the street to an ice cream store. We sat outside the store and enjoyed various flavors of ice cream. After eating our ice cream, we drove a short distance farther on Route 270 to the picturesque St. Augustine Church. I don’t convert many photographs to black and white; however, this photograph seemed to lend itself to the conversion quite well. This walkway led to the church’s front door. Isn’t the red door pretty? I walked inside the church. This photograph of the church’s interior was captured without flash. To do so I raised the ISO to 1600. I like how the light is streaming through the slightly ajar door and how well the stained glass windows show up. After exiting, I walked completely around the church. The enclosed cemetery plot, with the side of the church as a background, attracted me. This beautiful stained glass window was to the right of the windows in the photograph shown above. The church shots are beautiful also, love the one in black and white and color. You captured some fantastic shots there Linda and I found the story of King Kamehameha's statue fascinating. Years ago we went over to the Big Island for the day when we were actually staying on Oahu, and Gregg says he is sure he remembers seeing this statue there. I only remember the one outside the Palace on Oahu. Do they remove the lei of King Kamehameha's statue when they have wilted?How long were you there? @Ann – I do know that the lei are removed from the statue. I do not know the timing of removal, though. I would not think the lei would be thrown away either. I suspect they are placed somewhere remarkable. I searched a little bit on the Internet to learn the disposition but did not find the answer. We were in Hawaii from May 17-31. Wow the statue was so beautiful with all the leis. I loved the photo of the church in black and white too! You asked about my post in the park if it was chilly. Yes, it was. The park is located in the foothills of the Siskiyous, so the elevation is high and we have been having a cool summer so far. Most days are in the low 70s with a few reaching 80's. It is so lovely and green and we love the creek too! Thanks for the beautiful tour, Linda. I never got to that Island, but I would sure like to one day. Linda: Great set of photos from your trip. Hi Linda i envy not only the experience, the views and sceneries but most especially your very clear and well composed photos. It seems like i can't seem to get very clear ones, i still dont know why. BTW, i really love Kona coffee, i actually miss it. Linda, I loved these! And that one in B&W is perfect. The story of the statue was really interesting! I love the church, both the black and white and color photos are lovely. And I liked the interior shot as well. All so peaceful and beautiful!